~ Spring 2013 had a remarquable period of persistent Cyclonic activity caused by adiabatic surface to air profiles. from the spring onwards, ultimately leading up to affect the sea ice minima, by severely reducing sea ice compaction, in effect stunting a sure to be greater melt than 2012. Adiabatic air welcomes cyclonic invasions, while stable much colder surface air acts as a barrier, a wall against cyclonic penetrations. 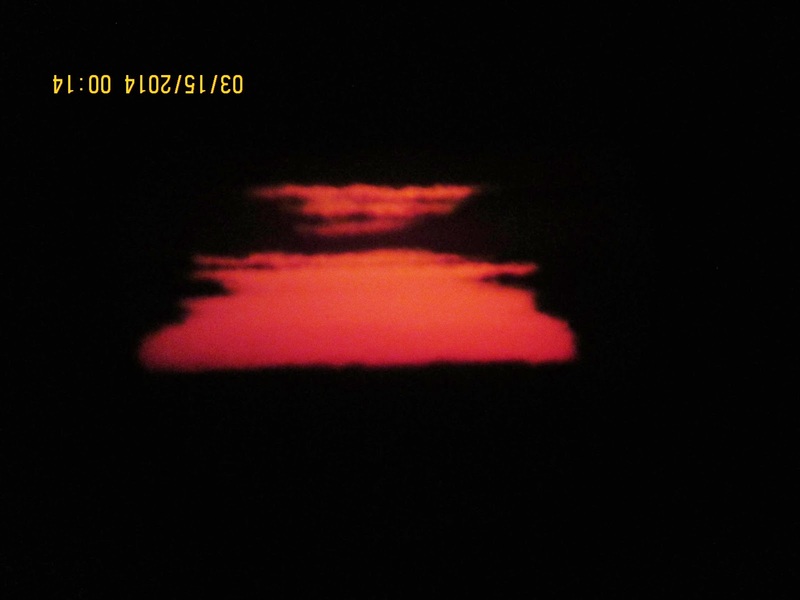 Triple Green flashes (seen red because of the filter) on top the much flattened setting sun of March 15 2014. Clear signals by the heavily stratified nature of the lower atmosphere, a sign that sun rays traversed an anticyclone. 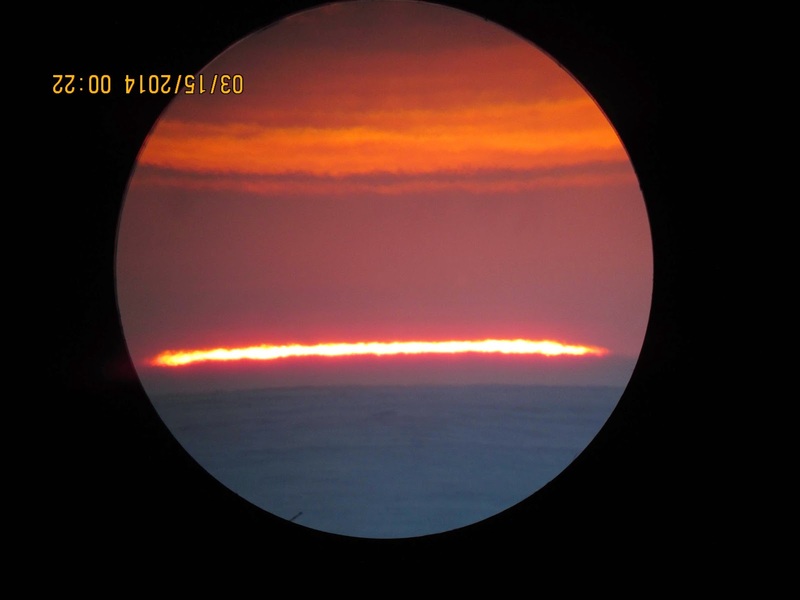 Same day right after not so famous but awesome sun line, not seen like this so bright and strong for years. The sun here is seen entirely compressed about 30 times. Looking like"fire on the ice". 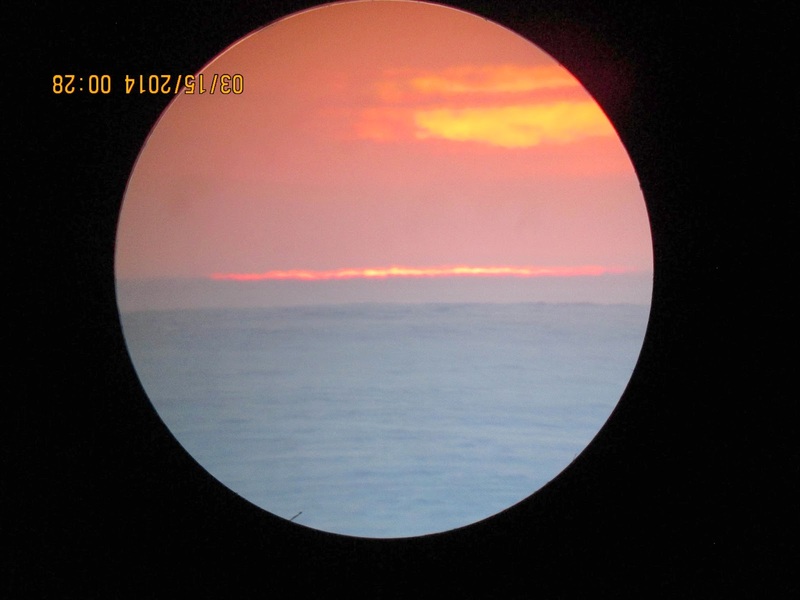 The sunset ended -2.23 degrees below the astronomical horizon. Below -2 degrees sunsets were quite rare over the past 8 years. The thicker sea ice of the Northwest passage cooled faster after a day of sunlight hitting it, this created many isothermal layers right above, since air didn't cool as rapidly, ideal conditions existed for refraction ducting. Warming in the Arctic blasting cold waves Southwards? ~ Apparently the Arctic can do 2 things, either it has a deeply frozen atmosphere spreading outwards or be warmer at once. while February 2014 (right) was substantially warmer, with a much weakened Arctic Ocean winter. Lame , more than twice smaller. How can most presenters claim Arctic blasts lowering the temperatures enough in Eastern Mid North America to almost freeze the Great Lakes completely, when a really cold historical Arctic had less an effect on the same lakes? The answer is spatial compression and also a greater potential of heat radiation to space over the continents primarily because the continents cooled more readily as they are physically unchanged, opposed to a cloudy Arctic bombarded with Cyclonic intrusions having changed Sea ice wise. missed some extent of the boreal forest area cooling in Mid-Quebec, radiosonde measurements there were in excess of -43 C at 600 mb. But the rest of the Arctic ocean 600 mb temperatures were more than 20 C warmer.